Cardiovascular - Sichuan PriMed Shines Bio-tech Co., Ltd.
Cardiovascular disease is the number one cause of death globally. Innovative new therapeutics that can modify or even reverse heart failure progression, especially diastolic dysfunction, are needed to reduce the disease burden in the general population. However, research into the development of novel and improved treatments is complicated by a lack of preclinical CVD models. PriMed Shines provides highly translatable NHP models and key technologies for CVD to help progress your novel agents into the clinic. Our CVD Imaging Translational Technology Platform provides heart failure, hypertension NHP models and multiple imaging techniques. With longitudinal (2-5 years) medical records, including echo and MRI, blood pressure, metabolic status, renal function, clinical pathology, body weight, food intake, cardiac biomarkers, vet treatment and dosing record. Diastolic Dysfunction and Preserved Left Ventricular Ejection Fraction with Aged, Hypertention, Pre-Diabetic/Diabetic Rhesus Monkeys Using Imaging and Circulating Biomarkers. 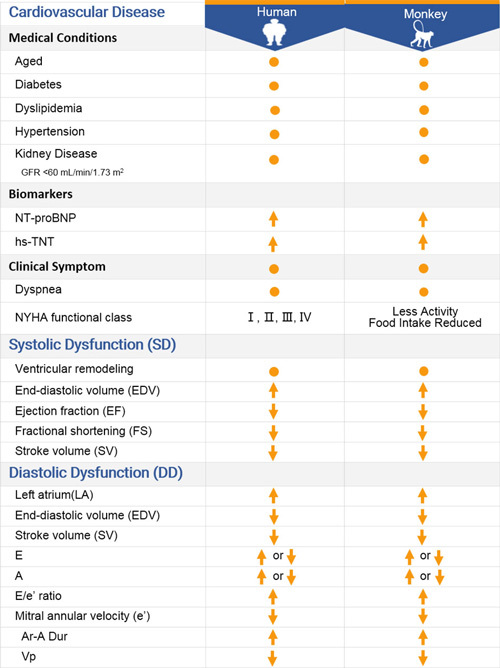 Diastolic Dysfunction and Preserved Left Ventricular Ejection Fraction with Aged, Hypertention, Pre-Diabetic/Diabetic, Chronic Kidney Disease(G3a-G3b) Rhesus Monkeys Using Imaging and Circulating Biomarkers. Systolicc Dysfunction and Reduced Left Ventricular Ejection Fraction with Aged, Dyslipidimia and Atherosclerosis Rhesus Monkeys Using Imaging and Circulating Biomarkers. 1993-P: Adaptation of Slow- and Fast-twitch Skeletal Muscles to Type 2 Diabetes Mellitus (T2DM) in Diabetic Rhesus Monkeys: an Initial Experience with Non-contrast MRI Microcirculation Mapping Techniques. 485-P: Application of CMR T1ρ Mapping and T1 Mapping in Diagnosis of Diffuse Myocardial Fibrosis in Type 2 Diabetes Mellitus Rhesus Monkeys with Myocardial Diastolic Dysfunction.